First model Artillery WWI Adrian M 1915 helmet. Made by JAPY Paris. Untouched horizon blue painted helmet. No serieus dents. Crossed cannons with flaming bomb Artillery badge with RF (=Republique Francaise). 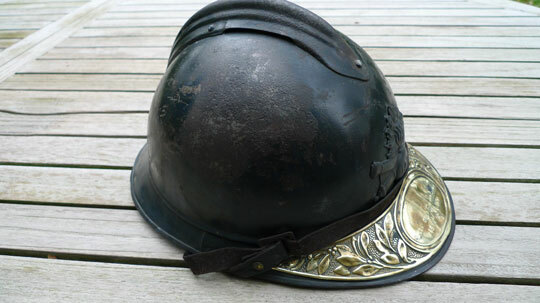 Comes with an original brass commemorative brass visor plate attached with rivets. It reads; Soldat de la Grande Guerre and 1914-1918 (= A soldier of the Great War 1914- 1918) in two lines in an oval. First model black leather liner with blue garance/rouge fabric inlay. first model goat leather chin strap. Size 56. Rare untouched early model. These commemorative brass visor plates were hand out to veterans after the Great war in 1919 to be affixed to their helmets and showed during parades.